Sold in bags of 50 pieces at $0.75 a piece. NEW SIZING AVAILABLE!! Great for the kids!!! Colorful pieces of Blue, Orange, and Green Calcite! Great starter pieces for the amateur rock-hound, or for someone's lucky rock! These stunning, polished free form pieces of Amethyst are sure to be an eye catcher in anyone's office or home. These vibrant Chevron (also known as Dogtooth) Amethyst is polished in beautiful tear-drop shapes and has a cut base for ease in displaying. Sizes range from Extra Small (the smallest being approximately 7" tall by 3" across the center and 2" across the base) to Extra Large (the largest being 9" tall by 7" across the center and 4" across the base). These are free form polished pieces and are priced by weight so the size and shape will vary. Sold by each. ON CLEARANCE!!! 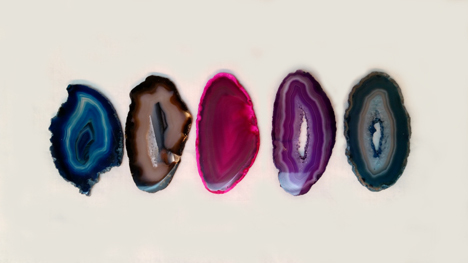 These beautiful Gold or Silver Plated Agate Slices have tumbled stone insets and are available in Blue, Black, Natural, Purple, Red, Teal/Green, or an assortment of available styles. Each pendant comes with an 18" gold or silver plated chain. *On SALE* *This item is to be discontinued once sold out. These pendants each contain a Tumbled Stone mounted in a gold or silver plated cap. Approximately 1"L X .5"W. Comes with 18" gold or silver plated chain and your choice of Amethyst, Amazonite, Carnelian, Quartz, Rose Quartz, or an assortment of available styles. Sorry, selection of inset stone not possible. Price is $.85 each, sold in bags of 100 each. Due to this being a product from nature, all sizes are approximate. PPRS will not accept requests for returns or refunds for variations in sizes. #00 Thin Slice: approximately 1/8 inch thick .5" to 1" approximate width and 1.5"-2.5" approximate length. Size and shapes of slices will vary. Bags come in Blue, Natural, Pink, Purple, Teal or Assorted colors. Due to overstock, ATS00/PR (purple) have been discounted to $72.00 until sold out! **PLEASE NOTE!! ** This product is dyed with a mineral based dye. As with most artificially colored items, if this product is used or left in a wet environment, it may cause the dye to bleed from the stone. Pikes Peak Rock Shop will not be responsible for damage caused by using this product in a wet or damp environment. Natural (ATS00/N) Pink (ATS00/P) Purple (ATS00/PR) - ON SALE! Sold by each. One-time only!!! No backorders. 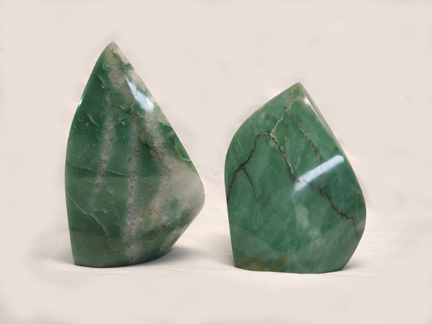 These stunning, polished free form pieces of Aventurine are sure to be an eye catcher in anyone's office or home. This rich Aventurine (also known as Green Quartz) is polished in a beautiful tear-drop shape and has a cut base for ease in displaying. There are only 3 pieces available and vary in price from $156.00 (discounted from $183.00 due to minor imperfections) to $267.00. Sizes range from 6.5" tall by 5" wide at the smallest to 9.5" tall by 6" wide.